Ammo Cans are must-haves for portable storage. Each is gasketed to seal out the elements and built to take punishment. Rubber O-ring seal protects contents from dust, moisture rugged steel construction. Top clamps down tight. All are Olive Drab. 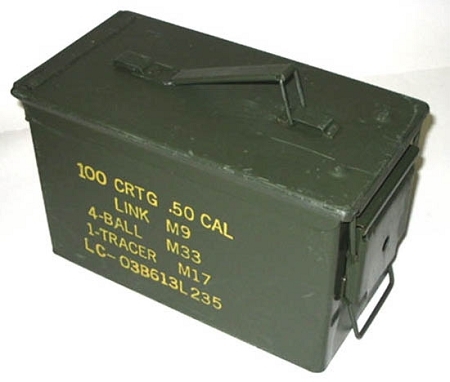 Original Military ammo cans are used extensively in the field to transport a variety of calibers of ammunition to the troops, they are constructed of heavy gauge steel. These are ideal for storing ammunition and they are stackable. All the cans have many years of use left in them. • Size: Outside Dimensions (approximate): 11-3/4" x 6" x 7-1/2"
Q: What grade are these ? Is there any rust ? Thank you. A: These are actual military ammo cans that are purchased from the military after use. They are then cleaned, and inspected for dents and ensured they operate correctly. If they make it through the inspection they are sold to us and we pass them to the public. Now, we have never been given a grade for them and sometimes there is slight rust; but if we had to grade them (keeping in mind they did come from the military) we would give them a Grade A rating.